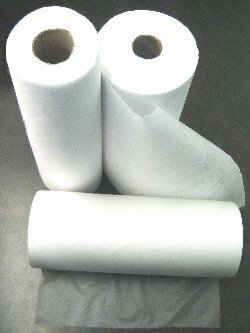 FS-1 White Lightweight Fusible Backing 15 x 25yd. Embroidery Stabilizers > FS-1 White Lightweight Fusible Backing 15" x 25yd. By fusing the stabilizer to the back of the garment, the fabric will not move or stretch leading to better registration. The stabilizer is temporarily attached to the entire area where the embroidery will be stitched eliminates the use of messy spray adhesives which only "spot" tack and allow shifting of the fabric and are quite messy leaving residue on needles hoops and machine parts. We use a low melt fusible –260 F so as not to scorch or shrink your fabric. When you are finished with your embroidery, re-fuse the edges- peel back and trim around your design. One layer should support 10-12,000 stitches of a moderately dense design. If you add a midweight tearaway as a sandwich it can hold an even higher stitch count!